'Please Don't run away I won't hurt you. Everything is going to be all right but I need a place to sleep at night.' Disney Engraved Etch Lt. Ed. Framed. 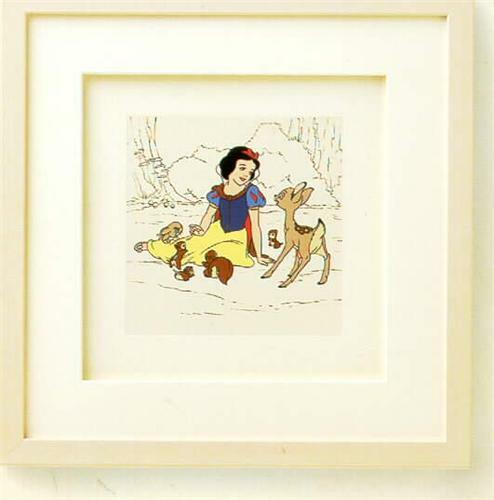 This Disney Treasure is a magnificent fine art print produced by a combination of age-old graphic process. The Engraved drawing is made with a steel etching needle through a thin layer of acid-resistant coating on a highly polished copper plate. The actual etching agent is acid: the lines drawn with the etching needle merely expose areas on the metal plate. When the design has been drawn on the plate, the plate is subjected to acid by immersion. The plate is removed, rinsed and dried, and the lines that the etcher wants faintest are protected with varnish. The plate is then placed again in the acid bath to deepen the etching. It is inked with a dauber and wiped to leave the ink it the etched lines only. This picture does not do this piece any justice at all It is beautiful. I am offering this piece for is a real deal!!!!! I have seen this piece sell for as much as $350.00.